Saturday evening saw a short break in the bad weather, and some clear sky. A slight haze and near full moon made the conditions not too excellent, but I managed to catch positions on Lacrosse 5 (05-016A) and the NOSS 3-2 duo (03-054A & C). 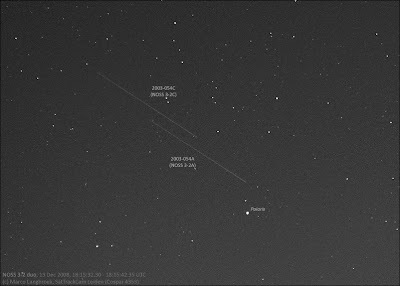 Below is a picture of the latter crossing near Polaris.